I know I’m just one guy, but I don’t like the new format. It feels like I’m only getting a fourth of the old role playing tips. I really liked the extra tips and additional reader tips sections. You are right. There is less content. I’m struggling with this too, so it’s still an experiment. Last issue and this one took far less time to prepare. I was getting snowed under and noticing the beginnings of burnout. It felt like I got my weekend back last week, which was a nice feeling. I do still plan to post reader tips. I’ll compile those into standalone issues, if the experiment continues. I also plan to continue writing the Murder Hobo session logs. I’m not sure yet where to put these. I’m thinking about moving them to the blog and posting a quick links to them in newsletters. This issue I decided to put the latest log in the Brief Word section. I’m not sure the best place for it. I don’t feel they have enough weight to be standalone emails to you. Feedback is welcome. Thanks for the feedback Shane, and everyone else who sent in comments. So, speaking of session logs, we played on Thursday night and it was mayhem. Here’s how things went down. The Murder Hobos, 12 miles underground, trying to cross a plain stone bridge while being attacked by gargoyles. Last session the Hobos had stormed the Sacred Stone Monastery on a quest to find Gar’s daemon-slayer sword stolen by a cultist. We begin S2E10 with the party taking a few minutes to catch their breath, then delving into the breech once more. Bypassing a trapped stairwell, they descend into a room with three terrible monsters (umber hulks) trapped behind bars on one side and a tough metal door on the other. The Hobos quietly investigate. However, they hear a voice on the other side of the door: “Has anyone got pants?” Then a loud thunder crack nearly shatters the portal. The umber hulks succeed in breaking down the cage door and a confusing fight erupts. The creatures’ gaze fails to foil Mr Pants, but other Hobos become incapacitated. Hobos start to hurt. But Mr Pants saves the day with vicious taunting that distracts the creatures. Just as the party starts to tip the battle, a bulette and rider chews up through the floor and join the fray. Malcor and Roscoe lay into the new foes. Vargulf in giant snake form restrains an umber hulk and squeezes tight. Six recovers from his confusion and lays into the creatures with deadly magical attacks. The Captain taunts with his shovel, further distracting the enemy. Finally, after much bloodshed, the fight ends. The Hobos retreat back upstairs to heal and rest. But their convalescence gets interrupted by a cult counterattack. They dissolve the floor! Gar falls through into the umber hulk room and gets swarmed by cultists who beat him with morningstars and fists. Malcor lowers a grappling hook into the hole and lifts Gar out. The other Hobos stream downstairs and attack the cultists after Captain Pants casts stinking cloud. After another tough battle. The Hobos emerge victorious with several cultists fleeing. The PCs rest again, and this time they remain uninterrupted. Recuperated, the party explores the lower mines and enter a large chamber filled with sarcophagi. Skeletons dust themselves off and attack, while a flaming skull emerges from hiding and melts the air with a fireball and a flaming sphere. Then six invisible duergar charge at the Hobos. It’s mayhem and the group blasts, hacks, and taunts their way to victory. Searching the chamber reveals an enchanted ring. It bears an inscription: Tulenkestävä. Six mediates with the ring for awhile and learns that is the ring’s name and it can offer its wearer resistance against fire. While the wizard rests, the party hears screams coming from somewhere in the mines. It sounds like murder. Malcor, Roscoe, and Vargulf investigate. They soon come upon a grisly scene. Several slaves have been dismembered and killed, bodies tossed before a closed and padlocked portcullis. Roscoe picks the lock and the Hobos follow a bloody trail into a dark stairway. They are confronted by a heavy metal door, which Roscoe unlocks. Now the Hobos are in a long, windy passage with steps descending into blackness. The PCs run for five miles then decide to report back to their fellows. Six has not been idle during this time. He’s investigated a large and special sarcophagus at one end of the crypt. The lid has a warrior with long bear carved in bas relief. The front bears a simple inscription reading: Samular Caradoon. The bard has heard of this family. They dwell in a manor to the south. Several brothers. Otherwise, nothing else stands out about them. The sarcophagus is empty but clean. The PCs are stumped and rest. Bright-eyed and cheery, the Hobos break camp in the crypt and return to the portcullis and dark tunnel. They journey almost an entire day, steadily descending deep into the earth, some twenty miles from the mines. Finally, they come upon a chasm, a rail-less bridge, and large broken portals on the other side. Six sends his familiar Ash the owl to investigate. She spots an entrance on the far side of the cavern, a small path carved out of the stone below it, and twenty stone statues lurking in alcoves beneath the bridge. Malcor forms up the party and prepares to descend into the chasm and get to the far entrance, avoiding the bridge and broken portals. Unfortunately, several statues come to life and reveal themselves as gargoyles. Ash is swarmed and slain. The Hobos fight. It’s a long, grueling battle against twenty flying creatures. Eventually, a cloaked figure appears in the far entrance and calls out to the creatures in a strange language. The surviving half-dozen gargoyles fly to the man and retreat. The Hobos catch their breath and we call it a night. The session went great. We added a couple of new aids to the game and they worked well. The first aid is three whiteboards I purchased from Staples. We experimented going gridless, and it went ok. However, we agreed after the session a one inch square grid was better for gameplay due to our style and preferences with the minis and whatnot. So I’ll quest for a way to make a permanent grid on the white boards. The second aid worked awesome. I purchased 20 knitting row counters from Amazon for $5. Each has double digit dials you can count with. 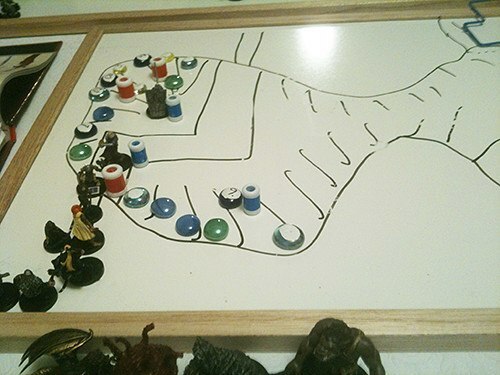 We placed one beside each wounded mini on the board, and tracked wounds fast and easy with them. That relieved me from a lot of tracking and they worked perfectly. The new player James was great. He and his bard brought a lot of humour to the game. The bard lacked damage output (yay, more roleplaying PCs which makes me happy) but performed well in a supporting role by weakening and distracting foes. Teamwork. We are scheduled to game again in two weeks. The PCs are about to enter the main temple of the earth cult! Try to fit some gaming in this week. In RPT#692 I introduced you to the work of Vladimir Propp and his underlying story structure of 31 Scenes. While his sequence is too linear to use as a campaign framework, you can use several of the individual scenes as encounter design tips. Today I’ll dig into scene number four: Reconnaissance. In Propp’s scene number four: Reconnaissance, the villain, often in disguise, spies on the hero. Early in Propp’s sequence, the villain is being proactive, and driving his agenda forward. This not only kicks the story into gear early but also brings the conflict straight to the heroes. At your table: A reconnaissance scene can be a frequent tool for your campaign and, as Propp suggests, can make an exciting opening scene. The presence of the villain or his agent so early in the story establishes the focus and stakes for a campaign. While the initial reconnaissance scene sets up the campaign, this type of encounter can be reused within the same game to renew the direct conflict with the villain and remind the heroes what they are fighting for. If the players have wandered too far from the central conflict, try a reconnaissance scene to remind them the villain still watches their progress and is ready to strike at them. A reconnaissance scene also provides an opportunity for the players and villain to engage in banter. These personal encounters with the antagonist help to motivate the party. A sneering, taunting villain is sure to irritate players, giving them motivation to thwart the villain’s plans. The essence of this meeting with the villain is a roleplaying encounter. So often, The players might see this as an opportunity to take out the villain. There are several ways for the GM to limit this risk. First, the villain could be in disguise, a common feature in the folk tales Propp studied. Another way to sidestep the risk of the players attacking the villain on sight is through the timing of their first encounter. As suggested by the ordering of Propp’s scenes, this initial encounter occurs before the great act of villainy that catapults the campaign into action. In this way, the PCs can form a personal connection with the villain before the players understand his agenda. Present such a meeting with the villain as a simple roleplaying encounter. The villain might be a noble or other person of importance whose patronage the heroes seek. The villain could attempt to recruit the heroes for a quest only to realise they are too morally upright to serve as tools. Or the villain could be a visiting dignitary whom the heroes must protect (but this visit is just an excuse to survey the kingdom’s defences prior to an invasion and not the marriage negotiations everyone expects). Suppose the heroes defend the villainous general from an attempted assassination. How are the players going to feel when the general later reveals herself to be the Dread Reaver and unleashes her demonic horde on the kingdom? These players will be quite motivated to clear their names and thwart the general to recover their lost reputations. Whether an encounter with the villain is run as a Propp prologue sequence or as a recurring scene, it will play out based on the villain’s intentions and the level of player recognition. The villain uses a disguise to interact peacefully with the heroes. During their meeting, the villain learns something useful about the PCs. The use of a disguise sets up a later scene in which the villain reveals this information in a conversation. This secret encounter with the villain explains why the villain knows so much about the heroes and thus precipitates a series of direct attacks on them. The reconnaissance scene is used for information gathering, a tactic cited directly by Propp. Later encounters then feature agents of the villain dogging the heroes’ every move. Perhaps the villain uses his secret knowledge to throw additional obstacles at the heroes, such as kidnapping family members, attacking their homes, or undermining their reputations. Another possibility is the big reveal. The old crone wearing the scarlet shawl was actually the Dread Reaver in disguise! If you time it right, this big reveal makes for a great scene later in the game. If the disguised villain was a memorable character, the players might be shocked to learn of the deception. However, be cautious when using a disguised villain. This method should be used infrequently, as it leads to players being suspicious of everyone. The payoff can be good, but this version of the villain encounter risks alienating the players to average NPCs. The second style of villain encounter involves the disguised villain antagonising and taunting the heroes. A satisfying conclusion to the scene is if the villain reveals his true identity just as he departs. Unlike the previous model, here the payoff is immediate. The GM should expect the players to want to pursue the villain. This version of the reconnaissance scene allows for all the banter and insults you would expect from a confrontation with the villain. The resulting animosity towards the villain should sustain the campaign for quite some time. The opportunity for trading insults is a strong reason to bring forth the villain for a direct encounter with the players. However, the GM needs to head off the possibility of violence once the villain’s identity is revealed. Prevent this violence from derailing the entire campaign by juggling the situation. The first option is to reveal the villain’s identity just as he leaves. Teleporting, planar portals, or a fast mode of transport unavailable to the heroes ensure the villain’s successful exit. Alternatively, have the whole encounter take place in a weapon-free neutral location. Holy ground, religious ceremonies, prestigious social functions, or a royal court might prevent violence. This frustration at a missed opportunity will also fuel the players’ desires to chase down the villain through the campaign. With violence constrained, this version of the reconnaissance scene is better than the first as it allows for all the banter and climaxes with a satisfying reveal. The confrontational nature of this encounter should make players less suspicious of any NPC who asks them questions. There are many moving parts to this encounter for the GM to juggle, but it will be a memorable scene for the players. This encounter is a simpler version of the previous one. Here the villain lacks a disguise, but still appears in a setting where the heroes cannot respond with violence. A classic example is the evil vizier, the unacknowledged power behind the throne. By avoiding the NPC’s disguise, this scene lacks the climax of the big reveal. However, this is compensated by the way the villain can build up resentment in the players. Here is their avowed enemy, yet the heroes are limited to merely barbed insults as a response. If your game features a social combat system or other method of pitting skills against each other, this is a brilliant opportunity to use it. A recognisable villain interacts peacefully with the heroes. This works best before the villain reveals his nature. The heroes could be invited to dine with the vizier, thinking only that this is a chance to network with the King’s advisor, unaware of the vizier’s true nature. When the vizier is revealed to be the villain, the players can look back on this scene as a missed opportunity. As noted before, the villain may be using this scene to learn more about the heroes. Thus banter will be likely kept to a minimum, and you should play this as a straight roleplaying scene with a noble. Running this scene builds a personal connection between heroes and villain. This method utilizes an agent of the villain as the central character. It works best when this scene is repeated later in the campaign. This agent might be a mouthpiece of the villain, allowing for all the banter and knowledge of the villain to be used. Or, the agent could be a trusted lieutenant of the villain, confronting the heroes as part of a mission or in pursuit of a personal agenda. Villain agent scenes work because they present roleplaying opportunities that can descend into violence without risk to the villain. For many groups, this will be the best of both worlds: witty banter and swordplay. You might need to manipulate events to allow for the roleplaying before swords are drawn. Overzealous players may insist upon attacking the agent right away. If this happens, you could ask players to wait a moment to allow some preliminary roleplaying, assuring them they will still have the chance to strike first. Or you could intersperse moments of banter within the swordplay. Have each strike accompanied by a suitable threat or insult. This extended banter can be just as fun as a peaceful conversation and mimics the dynamics of many classic film duels. Before concluding this discussion about variants of Propp’s reconnaissance scene, it is worth considering what to do if the worst happens and the campaign villain is slain by the heroes. Sometimes the players are just too aggressive, or perhaps they rolled really well and the villain ends up dead as a result of the reconnaissance scene. This need not be the end of the campaign. The GM has a number of options. It was just an illusion, an old school cliché, but it keeps the villain alive. Rather than have the body of the villain mysteriously dissolve on death, it would be best to have the illusory nature of the villain made clear once the PCs hit the villain in melee combat. Otherwise, this option seems too much like a GM trick. This was just an agent of the villain all along, or a possessed body and the spirit of the villain escapes in a cloud of smoke. Handle this option with care, as it feels too much like a GM trick. This can be mitigated if the plot supports a series of clones, or similar possessed bodies, as a regular tool of the villain. The death stands, but a new villain steps forward. This is the most interesting option and maintains player agency in your game. Here the GM accepts the death of the villain, perhaps allowing the PCs a period of rest as the broader campaign threat is currently lessened. However, it is not long before dire news reaches the PCs – a new leader has arisen. A leading lieutenant of the slain villain has assumed the mantle and is continuing the villain’s plots. The GM could escalate this twist by making the new leader even more ruthless than the first villain. So the PCs had their moment of glory, but now the situation is even worse. The villain meets the PCs with overwhelming force. He merely wishes to talk, and the PCs are forced to be civil lest they face annihilation. The villain might have a horde of minions nearby, lieutenants too tough to fight beside him, or his special pet on a leash. The PCs are made aware of the vast difference in numbers only at the moment violence would erupt, and they are forced to quell or suffer a TPK. For example, a simple shopping trip. The PC’s have a race to purchase various items in the market. They have a set amount of gold to spend and have to haggle with the merchants to acquire the items. Most of the stalls don’t have the items but take time to visit. The PCs have to be nice to the merchants because the Market Guard is always on the watch for anyone stealing or misbehaving. Throw in beggar children that crowd around being annoying, picking pockets of items obtained or the gold coins. The villain has always been a few steps ahead of the PCs. So the party will be wary of just attacking because it could be yet another trap. A powerful, neutral NPC (the King, for example) has the villain on his good side. The NPC has high regard for the villain and is not necessarily involved or knowledgeable of an evil plan. 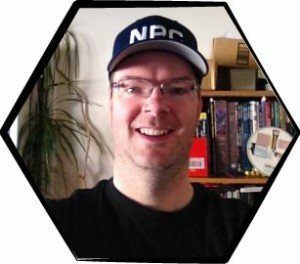 The PCs can’t attack the villain, else they risk making the important, neutral NPC an enemy. The villain is actually a hologram or magical projection. A government-sponsored event is a good situation. It would have large crowds and lots of security. For example, a royal wedding, a state funeral, or the (re-)dedication of a national monument or infrastructure facility. Law enforcement or the military will be present in large numbers and on high alert watching for bad actors or even mildly-suspicious persons and activities. But the main attraction itself is the perfect distraction for an unrelated, once-in-a-blue-moon, low-profile infiltration/pilfering/confrontation opportunity behind the scenes nearby, or even right there in plain sight on the public stage. The villain stages a meeting on church, temple, or holy ground where violence is forbidden. The villain uses a contingency of some kind. He kidnaps someone the PCs care about or need, and holds them hostage against the PCs’ good behavior. Likewise, there might be an important item or location the villain threatens to ruin if the PCs get violent. Perhaps the villain holds a map above a torch, or a flask of poison over the village well. There are many ways to run Propp’s reconnaissance scene in a campaign. This can be an early encounter with the villain, perhaps even before the villain is identified by the players. Later in the campaign, the GM can weave additional reconnaissance scenes into the story to revisit the villain, exchange some banter, and ensure the players remain focused on the villain. Run Propp’s reconnaissance scene to add villainous banter to your campaign and make the battle against the campaign villain a more personal one. That’s it for today’s issue. Thanks to Brenda Crowell for editing. please consider becoming a Patron today.